The streets of Johannesburg are bustling with activity, an intrinsic characteristic of the CBD. Women selling fresh produce sit in the sun all day, with green spinach, blood-red tomatoes and ripe cabbage enticing walkers-by. A colourful array of people can be seen lying face down on the grass in Joubert Park, the biggest public park in the CBD, an arrangement reminiscent of an artwork made of humans. Standing beside the still bodies, unaffected street photographers stand idly in the park, waiting for customers to ask them to take the perfect ID photo. And in the centre of this scene lies the Greenhouse Project, a quiet sanctuary filled with the smell of fresh herbs. The Greenhouse Project has stood on the corner of Klein and Wolmarans streets since 1993. The space flourishes with organic vegetables, herbs and plants, and many have walked through it – from volunteers to customers who thrive on organic living. Known as the Victorian Hothouse, a conservatory stands decrepit amongst towering trees that have stood the test of time. Below the ancient trees, their yellow flowers are scattered all around the tarred ground of the Greenhouse Project. Thabisile Mchunu, director and administrator of the GreenHouse, points out how beautiful they look. Mchunu, who is in her 60s, looks like she dressed according to the theme. She wears a lime green blouse paired with yellow loafers, a style that matches effortlessly with her dyed blonde natural ‘do. It’s clear to see that Mchunu fits in perfectly with the surroundings, which drew her permanently in soon after her first visit in 2011. The GreenHouse Project first caught her eye while she was a co-opted board member at CBU Hub, an organisation that specialises in community projects. The corporate world veteran swapped her high heels for gardening gloves and despite the shrinking of the initial CBU Hub members that visited on a regular basis, she developed a connection with the space, which eventually got her the role as director. 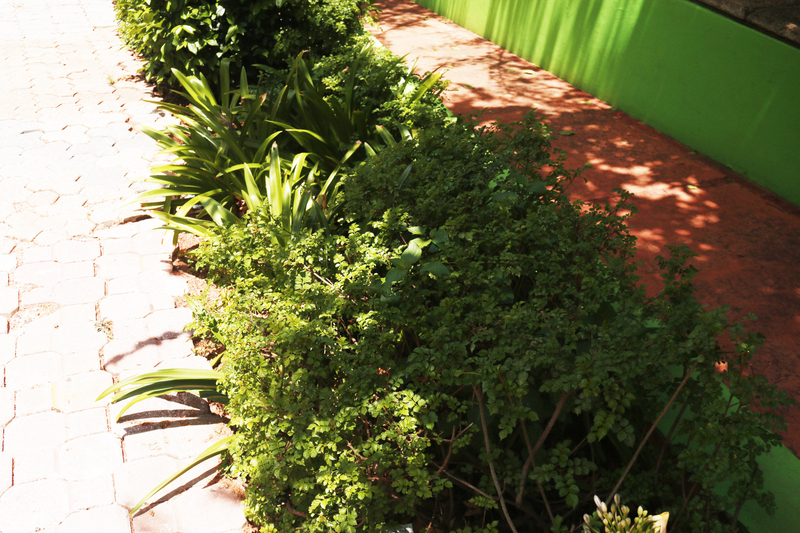 GREEN CITY: The City of Johannesburg’s Greenhouse Project in Joubert Park. YELLOW SEASON: Fever tree flowers sprinkle the grounds of the Greenhouse Project. 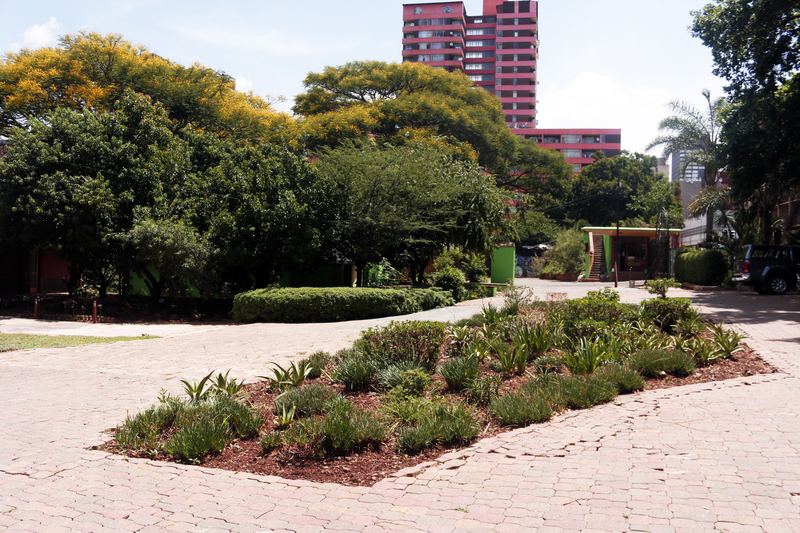 Mchunu has worked hard to keep the space open, which has almost been swallowed up by the ‘concrete jungle’ characteristics of the inner city. 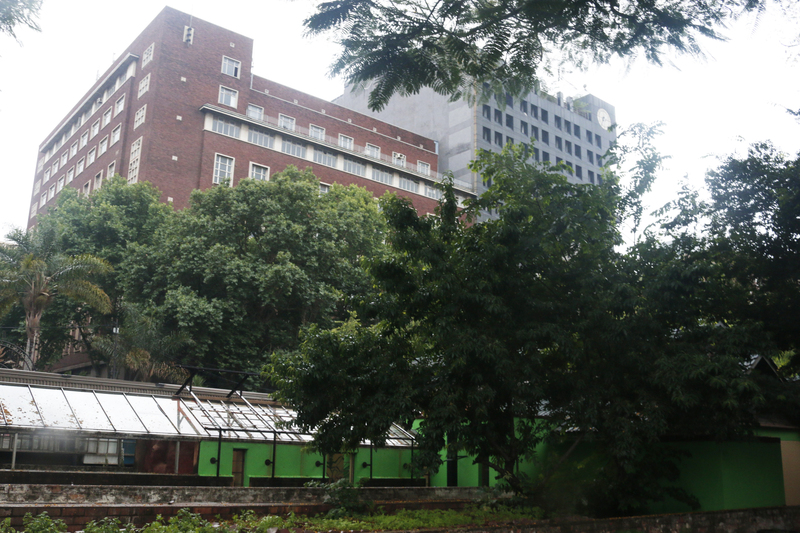 Joubert Park and the Greenhouse Project in its entirety almost became a part of the nearby MTN taxi rank which would have seen the green pastures being exchanged for tons of concrete and blaring greenhouse gas emitters in the form of taxis. Behind the tall trees, an abandoned grey building stands. The lack of life within it is emphasised by the pane-less windows gaping at street walkers on every floor. Hope of life is restored by the trees that unexpectedly peak off the rooftop of the building, a pleasant surprise for the onlooker. Proof that Johannesburg truly is a man-made forest, its nature making its home not only on the ground, but also on the city’s tallest buildings. However, between the building and the trees at the Greenhouse Project stand two large fences, one with elaborate electric fencing. To have a peaceful space in one of the most dangerous areas of Johannesburg means that, unfortunately, people have to be kept out and heavy screening by 24-hour security guards must take place when any person wishes to enter. But not all the people that the Greenhouse Project attracts have a desire to destroy the space. Beyond the big metal gates designed in the form of a vine complete with flowers, a group of workers armed with sunhats and gardening tools, are responsible for keeping the garden fresh and the vegetables growing. One pair of these green-fingered hands belongs to Sizwe Mazibuko, a volunteer hailing from the hills of KwaZulu-Natal. Mazibuko visits the Greenhouse four times a week, a requirement that forms part of the 18 months of practical work he has to do for his Farming Management Diploma at Umfolozi College in Richard’s Bay. Despite the variety of farms that can be found in KwaZulu-Natal, Mazibuko has found himself deep in the city of Johannesburg, where he has lived for eight months. Dressed in black from head to toe, and armed with a smile that exposes his two front gold teeth, Mazibuko’s face has several scars, evidence of a difficult life lived in his 28 years. 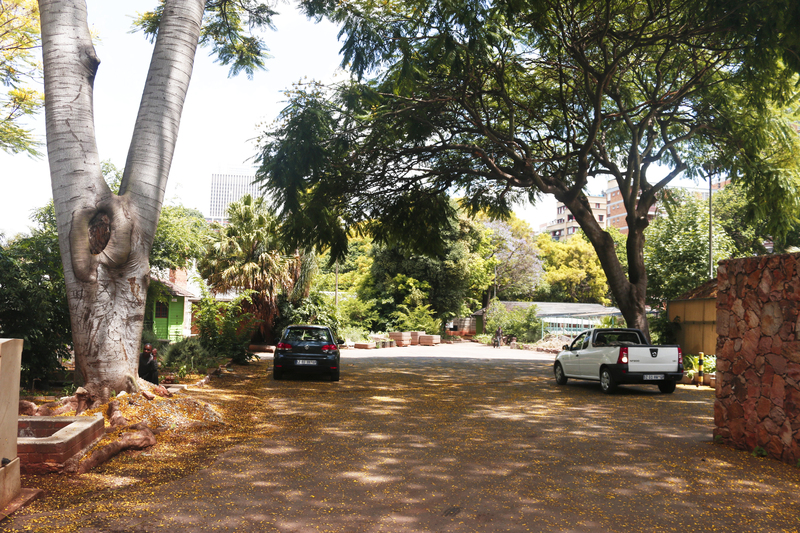 However, a year-and-a-half of volunteering work in Johannesburg will not cover his rent for the place he is staying at, close by to Joubert Park. Mazibuko works part time delivering bread around the city. “It is to survive. Life is expensive. At the same time, I don’t earn anything here,” he says. Although he is new to Johannesburg, Mazibuko has taken on the qualities of the typical city dweller: he is hardworking and determined. Goals are what are important to him, starting with the acquirement of his diploma once he has finished his practical segment. Thereafter, he would like to complete a Postgraduate Certificate in Education so he is able to teach people about his love for agriculture and organic farming. LUSH SPACES: The green spaces of the Greenhouse Project are looked after by a dedicated team of volunteers. But for him, the GreenHouse Project is a sanctuary in the rat race of a city. “I love this place. It’s a good environment for a human. It makes your mind work. I love each and everything you see here. It’s good for me because I’ve been through some times,” says Mazibuko, who grew up in the small KwaZulu-Natal town of Mtubatuba. A stroll further into the space reveals a small building donated by the Norwegian Church Aid, complete with a finished kitchen made up of wooden cabinets and marble counters – all recycled material. There you can find Dineo Tsoabi, a partner of the Greenhouse Project, cooking a fragrant pot of fresh spinach using the nifty biodigester, which Mchunu explains “uses food waste to generate gas that can be used for cooking, making hand creams, cough mixtures and hair products”. Tsoabi could easily be mistaken for a teenager if one had to judge her by her height, but she has lived for a total of 37 years. “As partners with Greenhouse, we [she and a few other women] develop the space, making sure the space is green,” she says. Like Mchunu, the Greenhouse Project first caught Tsoabi’s eye when she used to attend monthly CBU Hub meetings once a month at the space. 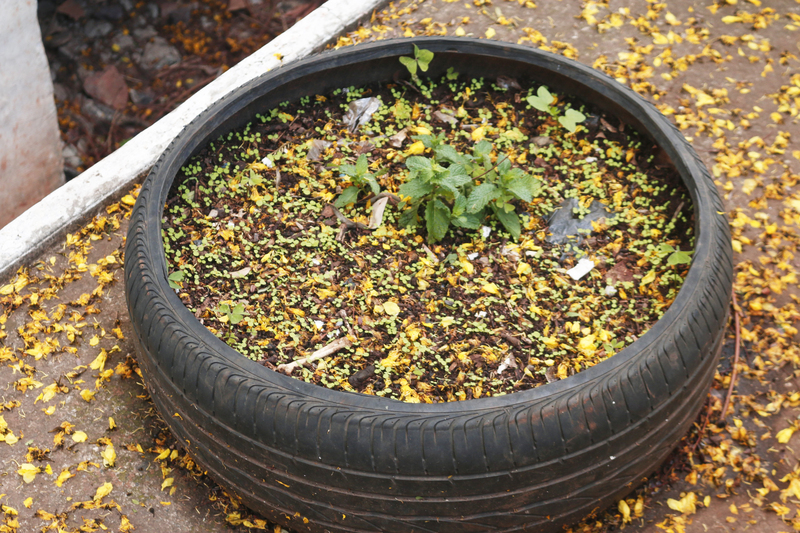 “We came to the agreement that if the Greenhouse Project deals with admin and funding, we will train students from university and the community to start food gardens,” says the partner, who hails from Vanderbjilpark, but now lives in the township of Sebokeng, which is also close to the Vaal River. Educating the community on organic farming is something that Tsoabi holds close to her heart. She can be found taking people on educational tours, both in the Vaal and at the Greenhouse Project and sometimes as part of the Edu Tours organisation, which specialises in school tours. Her 13-year-old daughter, who lives with Tsoabi’s parents, is also learning the benefits of farming. “I want to show her how important it is to grow food. Sometimes kids don’t know where things like cabbage and spinach come from, so I hope that she will pass on these lessons to the other kids,” she says. Dressed comfortably in blue gender-neutral overalls, Tsoabi comes to Johannesburg every day to work in the gardens. However, since the Greenhouse Project struggles with funding, Tsoabi and the others like her do not get paid on a regular basis, which means they must find other ways to make money. The streets of Johannesburg thrive with entrepreneurs on every corner, such as the women who can be seen day in and day out behind their own vegetable-selling stalls. The Greenhouse Project has embraced the entrepreneurship ways of the city, lessons that have provided Tsoabi with innovative ways to make money. “We sell produce to informal restaurants and the ladies who sell it on the street,” said Tsoabi, who also spends her time fighting the consequences of climate change by freely educating people of its dangers on trains. She also makes and sells skincare, medicinal and hair care products made only of the natural elements found in the gardens. Ingredients for these products include plants such as the fascinating stinging nettle with its rather contradictory characteristics. Needle-like edges of the freshly-picked plant leave a stinging sensation that lasts a few minutes if struck on the skin. However, it can also treat wounds and arthritis either by ingestion or direct application to the skin. Tsoabi says the people of Johannesburg have shown a keen interest in the Greenhouse Project, especially those from other countries. She is often approached to cure the sicknesses of others using herbal remedies. “I can make a general herbal mix for those people because I respect people’s privacy,” says Tsoabi. One of the go-to herbs for such a mix can be spotted in the garden in the form of blooming flowers named nasturium which acts as an antibiotic for a variety of infections. URBAN JUNGLE: The Greenhouse Project is the ultimate definition of the “urban jungle” with buildings peeking from the greenery. Tsoabi’s group is not the only set of healing hands at the Greenhouse Project. A wellness centre named Conlinea Health and Wellness is visited twice a month by a homeopathic doctor, Dr James Motaung. On the days he visits, the patient waiting room is packed with a variety of patients, mostly elderly, but the odd young person can be spotted in the throng. Masefako Matjie is at the doctor’s rooms for the first time, dressed in an attire worthy of a church Sunday – a floral dress with a pink blazer. Although the queues were disappointing for her, after she had travelled from her Alexandra home, she says she prefers herbal medicine over normal pharmaceuticals because “they lack chemicals”, she says. In the city of Johannesburg, where concrete, skyscrapers and cars can be the only thing in sight, the Greenhouse Project is a vision for sore eyes. The fresh vegetables and plants provide an aesthetic sanctuary but with them, the ancient practice of healing can be utilised across the city. A beautiful intersection between the economic powerhouse of South Africa and the biggest man-made forest in the world is created by the Greenhouse Project, which will hopefully remain for the benefit of Johannesburg’s urban dwellers for many years to come.